Little, Brown and Company, 9780316294591, 112pp. From the creative parents who brought the world the web sensation "Dinovember" comes photographic proof of what toys get up to when the rest of the house is asleep. You might have noticed weird things happening in your house. Unexplainable messes. Food all over the kitchen floor. Who could the culprits be? Dinosaurs! 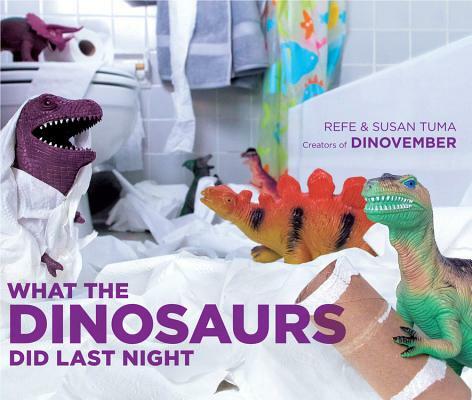 Boasting bright and hilarious photographs, along with a story written from the point of view of an older, wiser sibling, Refe and Susan Tuma's picture book documents a very messy adventure that shows just what the dinosaurs did last night. Refe and Susan Tuma live in Kansas City with their four children and a herd of plastic dinosaurs. The Tumas began cataloguing their dinosaurs' antics in 2012, igniting the imaginations of hundreds of thousands of children--young and old--across the world.